Cro-Manager presents the first part of the Exclusive'10 facepacks for the 2015/16. season.This pack contains 3207 pictures from seven different leagues: Premiership, Bundesliga, Serie A, La Liga, Ligue 1, MaxTV Prva HNL i Prva Liga Telekom Slovenije. You can either download the entire megapack, or every league on its own. 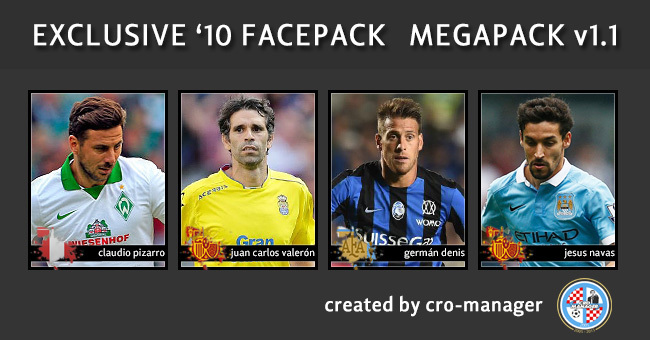 Exclusive '10 facepack is a product of the Cro-Manager community, which is making this eye pleasing add-on for Football Manager since 2009. and will continue making it as long as there are people willing to make it. This facepack comes in 140x180 px dimensions so it looks perfect on every skin. Although, in the future we will make special panel files which you will be able to put in your skin so that this Facepack so it can look perfect on skins that are not adjusted for these dimensions. Cro-Manager community presents a huge, so far unseen, MEGAPACK of the popular Football Manager facepack - Exclusive '10. The package contains exactly 24 006 pictures of different players. The Megapack contains all of the facepacks we made since the creation of this facepack (the ones I managed to download from active links). I've tried to combine all of the facepacks into one Megapack and here it is. Unpack the .zip file in the same location where your pictures from 1.0 are, when you are asked to replace existing files press "Yes". Finally, add the config file or the game won't show all of the 24697 pictures. Starting with this year, Cro-Manager Team has decided that in order to increase the number of facepacks being made in a season the template will be released to the public. In that way any of you can download the template at any moment and make any facepack you need. Of course, it would be great if you could uploud those pictures so we can add them to the megapack, in that way other people could enjoy in facepacks you made as well. Still, our Team will still take care about the quality of the facepacks, so if the pictures aren't good enough they won't be included in the megapack. To those interested in making this facepack, we produced several tutorials and we're hoping to make even more in the future. It would be nice from you to tell us what exactly are you going to make before you start so it doesn't happen that couple of people are working on the same thing. You can choose would you rather work on whole league or just some specific club and under this text you can find out which leagues or clubs are already reserved. you must be registered on Cro-Manager forum for freely download OR contact me!!! Nice style, cheers for the new mega-pack. Although, in the future we will make special panel files which you will be able to put in your skin so that this Facepack so it can look perfect on skins that are not adjusted for these dimensions. We have only 5 people in our team, and greek superleague isn't our priority. Unpack the .zip file in the same location where your pictures from 1.1 or 1.0 are, when you are asked to replace existing files press "Yes".